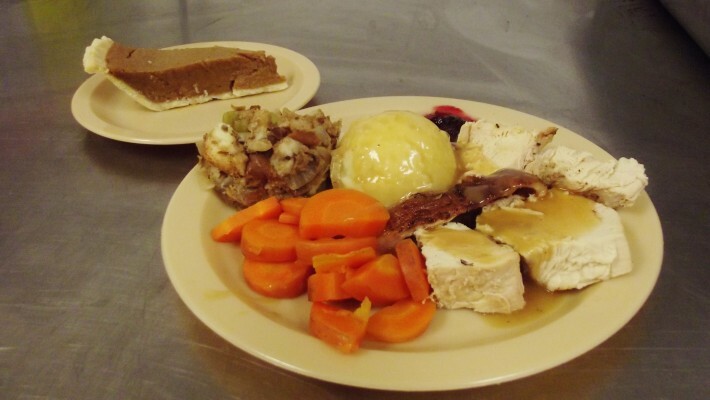 On Monday, October 12 the Friendship Inn served 1212 turkey meals to the guests of the Inn. Thanks to the generosity of the Saskatoon and area community we had turkey, potatoes, carrots, stuffing, cranberry sauce and pie for dessert. We had about 40 volunteers helping to prepare, serve and clean up from our special meal. One family has come to volunteer for several holiday meals now, and they spent some time interviewing some guests to find out what Thanksgiving at the Inn means to them.